The people are happy and very accommodating. I enjoy Pacifica and would recommend it highly. We have had great experiences with all the people involved with, showing us facility, rooms, signing up my dad for facility and letting us enjoy their lunch. With 1 to 10, I would rate them a 10! We are so glad to hear this! We try to go above and beyond with every resident and their family. We are so pleased that you feel this way! We strive to provide excellent care and service to our residents and their families at Pacifica Senior Living Escondido. Thank you very much, we hope you have a wonderful day! I have no problem with service; sometimes it takes a while to get some things to finish. They have a great crew that works well together with residents. My grandma lives here now. She is well taken care of. My grandma is here and she has a nice bedroom and likes her new friends. The people who work here are nice, too. I'm glad to visit my grandma here. They take good care of her. I went to Pacifica Senior Living Escondido. They had different levels of care there, but it wasn't what we were looking for. The staff was nice, and the room was basically like a hotel room. It wasn't homey. They had a movie room and a place where people would get together to play cards. My husband is a resident of Pacifica Senior Living Escondido. We chose this place because it's related to Meridian and is run by the same people. The rooms are nice, and they have very friendly staff. They have activities in the memory care unit, like going on outings on Tuesdays and Thursdays to get them away from the place for an hour or so. The food is like what you'd have at home. They also have a nice green belt so the memory folks can go outside and not have to stay indoors all the time. We also bring our two small dogs so they could run around on the green belt and the residents played with them. In Pacifica you would get the most for your money. The memory care areas in other places are industrial and not as nice as their assisted living areas, but it's not that way in this community. Thank you for taking the time to share your review, your opinion is very important to us. We are very proud of our community and support staff. Did you know we have a Facebook page with pictures of our residents and their interesting activities? (The link to the Facebook page is on our website). We look forward to your next visit! I visited Pacifica. It was spotless, beautiful, and everyone there was absolutely wonderful to us. However, it was too expensive, and the rooms were too small. Mary, thank you for leaving this detailed review about your experience with our community. We appreciate it and hope that you are very happy in the community you choose. Please let us know if there is anything else we can do for you; we are more than happy to help! I had a wonderful experience at Pacifica. It is a great place, and we enjoyed the people and the reasonable price. Everything was very good. They had almost everything that people want, like a library, but not the fancy things, like a pool. Thank you Angela for your review, your opinion is very important to us. We are proud of our community and the exceptional level of care we provide. Did you know we have a Facebook page with pictures of our residents and their interesting activities? (The link to the Facebook page is on our website). Please feel free to contact with any and all questions. Pacifica has two stories and is very nice and refurbished with new carpeting. The refrigerator is not quite where I would put it for an older person, but the grounds are very well kept. They do a lot of functions and keep my mother pretty happy with the piano and music activities. The medical assistance service that she utilizes is really good. They make sure that she gets her pills on time and the right ones, which was part of the problem we were having before she went into assisted living because she wouldn’t take her pills. They're very easy to work with when I have a problem either with paying the bill or getting her an appointment; they have a bus that takes her to appointments. The grounds have very nice scenery with a lot of trees and a lot of birds that live in the trees which keep my mother really happy, and a lot of grass. It’s just a really amiable place. They have a piano upstairs and cable TV downstairs, and do a lot of Bingo. Hi Marty, Thank you for your positive review! We are so happy to hear all that you like about our community and that your mother is happy. We try very hard to make life as nice as possible for all our residents. If you have any questions or concerns, please feel free to reach out to us at the community. We are here to help and make sure that our residents and families are happy! We also have a Facebook page that we update with activities and pertinent information on our community! My mother-in-law is currently at Pacifica Senior Living, and I love it. The place and staff are amazing. She has very seamlessly transitioned to this facility from her private home, which was wonderful. Pacifica Senior Living Escondido is an excellent facility. They are pet-friendly. They are very flexible on allowing a temporary respite trial for a few weeks, just to make sure he was comfortable before we put him in the facility. They were getting to know what the needs of my brother-in-law were. They are very, very in a personal level in their accommodation for him. He doesn’t have complaints with regards to their food. Emeritus appeared to be a clean facility. However, they need new furniture and they need to take better care of the facility itself. They had some wooden built-in furniture and it was really in bad shape. These needed to be replaced. They did say, however, that they were going to renovate. We saw one room and it looked like it could be efficient for one person. The staff was very friendly and very willing to tell us about the place. They did have many residents there. I like Emeritus at Escondido because it has more outside activities for their residents. They had activities wherein residents could go outside and plant plants. They had a nice outdoor area. The rooms that I looked are had patios and balconies. The facility overall was very nice and their staff were very nice too. Emeritus at Escondido was good for us. They had a very knowledgeable staff. Price was very good. However, our concern for this place was that it needed updating. The facility was worn and dated. Just because my parents are older, it does not really need to let everything deteriorate around them. I don't agree with that. The facility needed some freshening up. We're also worried about the security. The facility was not in the best neighborhood and it's not completely fenced. My words offer a small glimpse"¦book a respite stay for your loved one and you will find this a wonderful facility and cannot be beat! My mom was VERY skeptical at first so a respite stay gave her a chance to try it out. Before her 1st full day was over she had already picked out a vacant room and dubbed it "˜home'. She moved right in from respite to her own apartment by the end of the week (would have been sooner if not for our work schedules). The facility is not too fancy"¦feels like grandma's house (my mom and I both got a sense of "˜home' when we entered the front door). While the building is not new, housekeeping does a wonderful job keeping it neat and clean inside! The dining room is bright and open (my mom enjoys being able to look outside as she eats). The tables are always cleaned off and set nice before each meal. The grounds are very well maintained (my mom loves the 2 rows of beautiful roses out front). My mom's apartment is on the 2nd floor and while she didn't think she would like the idea of being upstairs, she quickly settled in using the elevator - it has a delay when closing (she uses a walker). She enjoys being able to open her sliding glass door every morning and absolutely loves her view from the balcony ~ it is like sitting in a park! My mom is able to step right into her own shower (there is about a 3 inch high lip to step over and secure bars on the walls to hold onto). Each resident wears a pendant and I like the idea my mom has help 24/7 if needed (there is no hanging cord on a wall). Each unit has a small refrigerator and its own individual unit for air/heat ~ both work great. Each resident has their own apartment key and can lock their apartment door when home or going out (not offered at some other facilities). The residents are also given their own key to individual mailboxes located in the downstairs main hallway. There is a beauty shop and small chapel on site and plenty of activities throughout the day for those who enjoy them (bingo, poker, movies, exercise/stretching, gardening, walks, outings, live entertainment, etc). My mom enjoys "˜happy hour' each Friday afternoon (drinks & appetizers). They have a "˜no salt/non dairy' diet but the cooks really know how to flavor the food! EVERYONE who works here always has a smiling face and seem to enjoy their job! They all interact with my mom on a personal level and treat her as if she is a family member (everyone is on a first name basis here)! I always feel welcome, regardless when I stop in to visit! My mom could not have found a better place to live and I absolutely love the fact I do not have to worry about how she is being treated! Emeritus of Escondido is the best a family could wish for! This is a nice facility. My grandparents have a one-bedroom place. It came fully furnished with a bed, couches, TV, etc. ; as a result, my grandparents didn't have to bring any furniture. There are also multiple amenities that make this place comfortable and secure. For example, there's a heating and cooling system for each unit that allows grandma and grandpa to control the temperature. In addition, there's also an emergency button in the unit that reaches a staff that is on-call 24 hours. That way, if there's an emergency that's about to happen (i.e. a major headache), my grandparents can immediately get assistance. In addition to having a comfortable room, my grandparents also appreciate the outdoors and the community. There are several walking trails and a lot of greenery, which makes it nice for peaceful walks and for reflection. There is also a good sense of community here, as there are many scheduled events that residents participate in. There are free exercise classes that help my grandparents to manage their diabetes. In addition, there is also a chapel service that takes place every week. My parents are spiritual, so this allows them to worship with other people of the same faith. Overall, it's a great facility. A fairly large place with decent landscaping. The lawn was sort of maintained but since it was dark at the time we were there, most of the outside features went unnoticed. Inside however was fairly nice, our friend working that night met us in the dining room (which was very neat and clean, although it looked a little out of fashion) and ended up showing us around the place. The rooms were pretty small but they seemed like they had just enough space to be comfortable and feel spacious enough. Everything was well lit, the walkways were clear, clean, and also well lit. My opinion of the staff is clearly biased since we knew each other personally, but the others that work there seemed friendly enough. Since we were with an employee they kind of left us alone. Only bad thing I can think of is that the building itself is kind of ugly. The facility was very big and spacious. They had a beautifully maintained law and plenty of gorgious flowers,and a walkway for the clients to use at thier convienience. Unpon walking inside is an entry, with a piano that the clients were playing, which caught my eye because my mom use to love playing. Their dining room faces the nieghborhood and has a decient view. The tables were made properly and very clean, not one spot on the glasses. The staff seemed very friendly and involved with the clients unlike most of the facilities in the surrounding neighboring areas. The bedrooms were generiously sized, maintained very well and there was not a speck of dust anywhere. The have plenty of daily walks and activities. The only thing that I didn't see was an big enough area for indoor phsyical activities. The other thing that wasn't very nice was the ulgy green carpet, but that isn't really a big issue, just an eye sore. All in all I would have to say that it was one of the best establishments that I have checked out, and I have been to no less than 15. Describe the overall population of assisted living residents at Pacifica Senior Living Escondido. What is their average age? What are their favorite things to do? The majority of our residents are in their mid to late 80's. They really enjoy our happy hours every Friday as well as bingo. We also have a gardening club that grow fresh vegetables and beautiful flowers. What programs or activities does Pacifica Senior Living Escondido offer to enrich residents' well-being? We offer a variety of activities every day, from exercise programs in-house to lunch outings at nearby parks and restaurants. What places are near Pacifica Senior Living Escondido or within walking distance for assisted living residents to enjoy? What transportation services does Pacifica Senior Living Escondido offer to assisted living residents? Our bus runs 5 days a week. Our residents use our bus for local outings, doctor's appointments, errand running and so much more. What makes the chef or dining program at Pacifica Senior Living Escondido exceptional? What kind of menu can assisted living residents expect? Our chef likes to keep things exciting. We serve anything from the traditional American homemade meals to the trending cultural cuisine. Our chef also loves to hear from our residents. We host a monthly Chef Talk where residents come together to share what they would like to see on the menu. What safety features or security measures does Pacifica Senior Living Escondido offer to assisted living residents? All of our apartments are equipped with grab bars and easy accessible step in showers. The hallways are lined with tasteful hand railings to keep steady as you explore the community. Every one of our residents is provided with a call button to page a caregiver for assistance. How does Pacifica Senior Living Escondido keep residents' families informed about their loved ones? Our staff communicates directly with families in regards to their loved ones' well-being. We typically make a phone call or send an email, whatever method is preferred. What is the care staff-to-resident ratio at Pacifica Senior Living Escondido during daytime and nighttime hours? In assisted living you'll see 2-3 caregivers roaming the halls day and night. You'll also find medication technicians either in the med room or roaming the halls to distribute medications to our residents. If Pacifica Senior Living Escondido accepts dogs or cats, what indoor/outdoor areas can they enjoy? Our building sits on 4 acres and the surrounding areas are very park-like. Most residents on the first floor are able to exit their apartment through their patio door to enjoy huge trees and lots of grass. Perfect setting for dog owners. Along with the monthly computer training that the staff receives we also have constant training on how we can better serve our residents. During the day, our staff includes a registered nurse, a med tech, three caregivers, an activities director, and other ancillary staff, such as kitchen, maintenance, and administration personnel. Our overnight staff is comprised of a med tech, two caregivers, and a registered nurse on-call. What safety features or security measures does Pacifica Senior Living Escondido provide to protect residents who wander? Residents who wander are typically best cared for in our Legacies (Memory Care) neighborhood. Legacies is a 24/7 secured environment. We also offer wander guards for those who don't necessarily wander but are best kept within the familiar area of the community. What programs or activities does Pacifica Senior Living Escondido offer to keep residents engaged? How does the staff engage residents' long-term memories? What techniques does Pacifica Senior Living Escondido use to support memory care residents during mealtimes? How does Pacifica Senior Living Escondido keep residents' families informed about their loved ones' health? Describe the neighborhood around Pacifica Senior Living Escondido. Is it located in a residential neighborhood, a business district, a rural setting, or other type of locale? 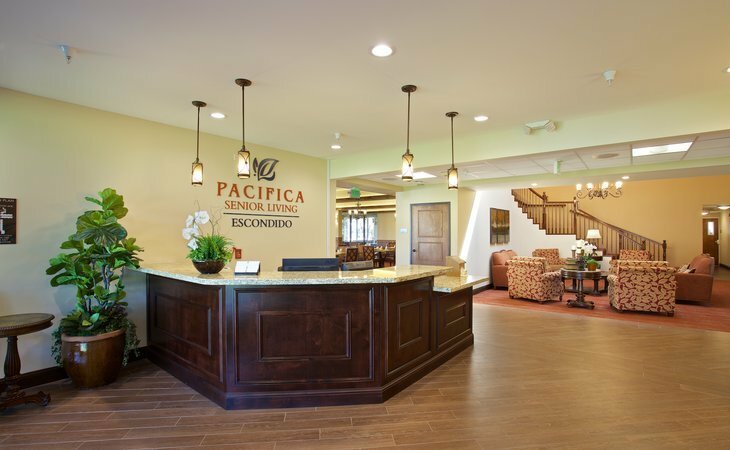 What should caregivers and potential residents know about Pacifica Senior Living Escondido?